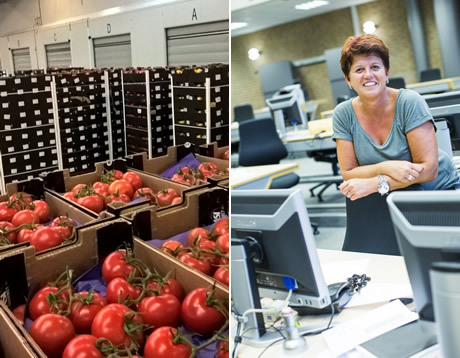 "This season, 20% more Spanish vegetables at auction"
Dutch Auction house, ZON, has been auctioning Spanish products for several years now. For this, these auctioneers collaborate with a dozen or so Spanish cooperatives. This season, the supply of Spanish products is, again, 20% higher than last season. "In the week before Christmas, the sales of some products was not going very well. However, after Christmas, the sales, fortunately, picked up again", says ZON's Auction Sales Manager, Els van Herpen. "Of course, this season has its ups and downs. However, in general, we are satisfied. The supply of Spanish products that are being auctioned are attractive to our small to medium-sized German and Dutch buyers in particular", says Els. "The quality of these products is excellent this year. We stay on top of this ourselves. Our quality controller, Piet Crienen, is in Spain during the winter season, This season runs from November until March. He inspects the products there in order to for us to guarantee the quality of these Spanish products." "Cucumber sales were difficult before Christmas. There was a lot of product on the market. This was as a result of the sunny weather. Luckily, after Christmas, the price improved again. With Spanish bell peppers, we started the season somewhat later." "This was because the Dutch product was on the market for longer. In general, sales were stable. We try to limit overlapping with Dutch products as much as possible. Tomato sales are currently satisfactory", she continues. "We specifically look to see which additional Spanish products will meet our bidders' needs. This year, there are, among other products, trussed plum tomatoes in our assortment. An important condition to begin with new products is that they fit in with our range. Their supply must also be reliable." "This is why we do an evaluation every year with our auction clients. We also do this with a focus group of our Dutch growers and the Spanish cooperatives", she concludes.